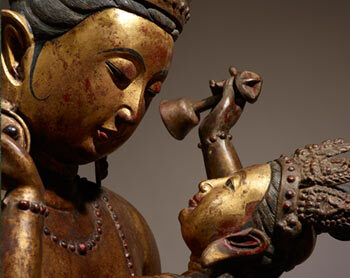 The Crow Collection of Asian Art opened its new show, Noble Change: Tantric Art of the High Himalaya last weekend. The exhibit contains eleven gorgeous copper Buddhist sculptures as well as one embroidered silk panel and represents work acquired by Trammell Crow last year for his private collection. According to Crow Collection Curator Dr. Caron Smith, the principles of Tantric Buddhism have in the past been dismissed as “titillating erotica or stultifying ritual” and during the 1960’s, were appropriated by the Hippie culture as a justification for their pursuit of un-inhibited sexual pleasure. Smith states, “The time is ripe to reveal tantra for what it is truly intended to be. In tantric Buddhism students use suffering and other negative aspects of existence in order to achieve a higher state of being, one in which the goal is to reach a simple life through reflection and the emptying out of themselves. When exploring the intimate gallery space at the Crow it’s vital that the viewer leave preconceptions outside. This work is highly symbolic, overtly sexual and somewhat complicated, but don’t let that intimidate you. Keeping in mind the philosophy behind this exhibit while viewing should at least make the works accessible enough to enjoy for more than aesthetic beauty, as they were intended to be. The deities on view in the exhibit represent various Buddhas. Two Vajradharas, in other words the first Buddha, are represented here, each signifying the unity of male and female. Part of the “revisionism” of tantric Buddhism allowed for a stronger role to be played by the female in the “story,” and in these Dorje Chang (in Tibetan), there is rampant symbolism indicating male aspects in the female, and vice versa. The other Dakini in the exhibit is Kurukulla or the Dakini of flowers. Using her feminine seductiveness, Kurukulla is able to subdue and pacify demons. She treads on a naked body representing her dominance over desire and the skulls surrounding her are reminders of death.